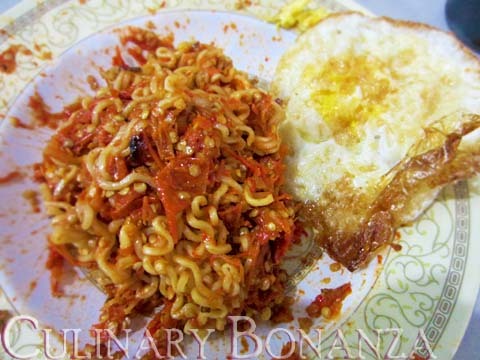 Looking back at my childhood, there was NO way, I would ever add chilli powder to my Indomie. I had even made my Mum cook a separate, unchillied bowl at family dinners, just for me! But back then, I couldn't cook yet and I still thought that KFC's O.R Burger was too exotic for me. Notorious for its tongue-searing, throat-choking, sweat & tear triggering instant noodles, Indomie Abang Adek has brought this MSG-saturated comfort food to a whole new level since 1995. 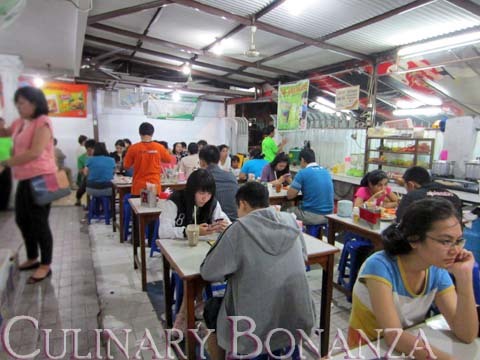 Today, the 'warung' (simply means a stall) never lacks of customers. Having braved all the odds and irony, it would not be wise, not to challenge myself to the maximum. Out of the 5 levels offered in increasing order: Sedang, Pedas, Garuk, Gila, Pedas Mampus, I recklessly ordered the hottest one (some even said this level contains 150 chillies!) with Indomie Goreng and fried egg. 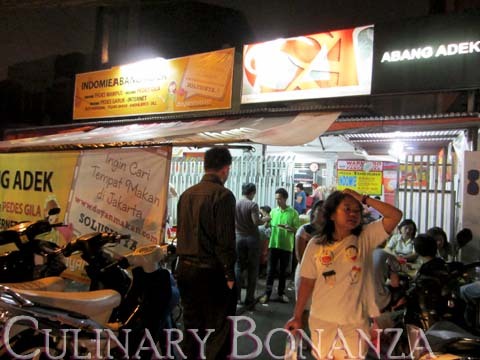 Instead of just sitting at the table and waited lazily for my orders, I sneaked to the open 'kitchen', which was actually the pavement beyond the gate. I witnessed the crews mass-preparing the noodles: seasonings and ground fresh chillies first, then followed by the noodles. Out of curiosity, I inquired the staff, they mentioned about unwrapping up to 18 cartons of Indomie (that's >400 servings!) daily on weekdays and up to 21 cartons (>500 servings) on weekends! About 20 minutes later, that plate of devil arrived. Holy crawp, was I taken aback! 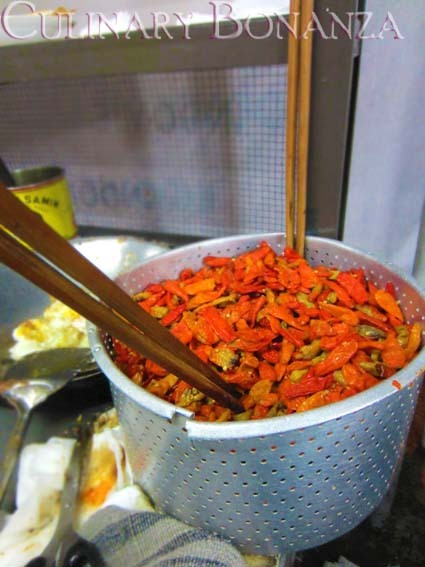 I gagged at the flaming red chillies, sickeningly threatened to burn my circulatory system! After a few snapshots, the fated moment was inevitable anymore. As with any casual Indonesian-style supper, a meal is incomplete without the all-time favourite dessert of either roti or pisang bakar (toast of grilled banana). 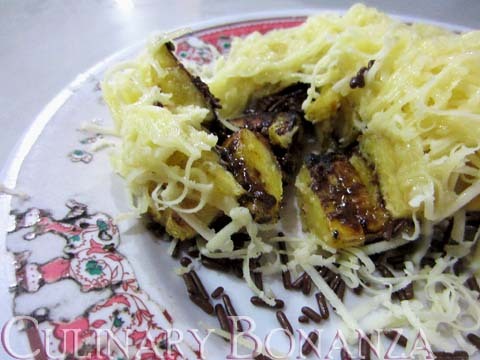 My choice: Pisang Bakar Keju Coklat (grilled banana with chocolate rice and grated cheddar cheese topping). The banana used is 'pisang uli', a type of banana native to Indonesia. Pisang uli tastes best after processed over heat, which tenderize and caramelize it. It was said that milk and cheese (or any food with fat-content) help to relieve the burning sensation caused by the capsaicin in the chillies. So that probably helped to palliate the burning sensation in my mouth. For a plate of Indomie Goreng (costs about IDR 1,500/pack) and literally tons of chillies (> IDR 30,000/kg at the market), the price tag IDR 10,000 was very very decent. If I live in the area, I will probably come back for more, but then, I'd go for the mildest chilli level, so as to be able to clean the entire plate. 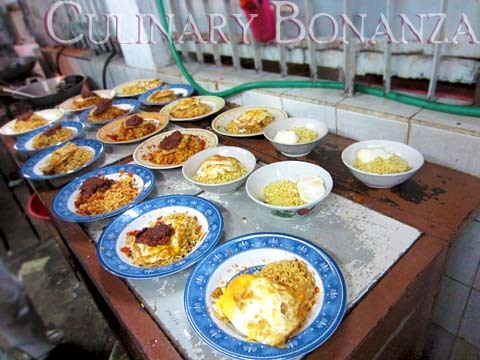 Otherwise, I'd very much prefer to cook my own Indomie, my style. I would boil it longer than needed and then toss the soggy noodles in the seasonings, without the chilli of course. PS: They receive orders for packaged meals as well. Care for some challenging supper? Mass-processing the mass-produced instant noodles? How long does it take, to empty this bucket? Direction: Once you are past Roxy Square. Turn left at the first bend and turn right at the 3-pronged intersection. Go straight all the way and you'll spot it! Man, how I love this place! Though I'm not fond of spicy foods, I think they're internet is already better than most places if not the best, it must be their higher quality corned beef. besoknya ga sakit perut dirimu?